Need something new and enjoyable for your next event? Grown weary of comedians, musicians, and dancers? Don’t worry; Casino Special Event can help you out! Do you remember as a child creating “flip art” on the bottom of your notebook pages and flipping through them as though they were a story? Our latest form of entertainment is similar to your childhood paper drawings! Our cutting-edge Flip Books encompasses childhood memories with laughter and silliness. Casino Special Event Flip Books consist of a 7-second video clip of one or more of your guests performing dances and skits. After 7 seconds, we allow your guests to review their skit or dance, and depending on whether or not they like it we go to print. After printing the video clip, we put the pictures through our paper cutter and are able to produce 60 images of your guests. We then put the images together in a book-like form, place a cover on top of the first image and bind them together. Within 2-3 minutes, your guests will be able to have their very own Flip Book to show their friends and family. Click the link below for a video! Flip Book VideoYour Guests will Flip for Flip Books! 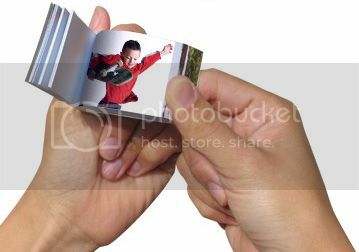 Want even more on flip books?! Click Here!